Daily Distractions: What happened to Stephen Fife? Through no fault of his own, Stephen Fife was not the talk of spring training a year ago. People were talking about the Dodgers’ high-priced roster of superstars and how they would jell, the eight starting pitchers with guaranteed major-league contracts when camp broke, and the intrigue surrounding rookies Yasiel Puig and Hyun-Jin Ryu. Fife had no chance of starting the season in the major leagues due to the aforementioned surplus of starters. So he began the season Albuquerque, only to be summoned to Los Angeles three weeks later when injuries struck Chad Billingsley, Ted Lilly and Zack Greinke. His return was hastened because Fife had a marvelous camp, his fastball suddenly sitting in the mid-90s after sporadically breaking 90 the year before. On Tuesday, Fife’s name was among the first group of players optioned to the Dodgers’ minor-league camp. So what happened? Fife said Tuesday that he was taking a different, less intense approach to spring training this year. The approach was born from wisdom, but also might have led to his premature demotion. After struggling with bursitis in his right shoulder for much of 2013, Fife began his off-season spending four days a week with Dodgers physical therapist Steve Smith trying to correct the mechanical issues that led to his bursitis in the first place. He said the scapula bone in his right shoulder had actually migrated up his back. It wasn’t until the second week of January that Fife said he was throwing pain-free. “I didn’t have much of an off-season,” he said. Maybe Fife could have touched 95 on the radar gun in camp. After a short off-season, he seemed content to save his best stuff for April and beyond. There were other factors working against Fife. The Dodgers wanted to see more from Zach Lee, Seth Rosin and Jarret Martin, three younger pitchers getting their first look in the Dodgers’ major-league camp. Each is still an unproven talent against major-league hitters. Lee and Martin might be deserving of a call-up later this season (Rosin is a Rule 5 pick who must make the Opening Day roster or else go on waivers), but they also need more time against major-league hitters in camp to earn that opportunity. Fife is a known quantity. He went 4-4 with a 3.86 ERA in 12 games (10 starts) last season. The 27-year-old has one option year left on his contract. Fife could always pull a Justin Sellers and sneak back onto the roster before the end of camp, or pull a Stephen Fife and find his way back by the end of April. That would require a spate of injuries to the team’s top starters, but we’ve seen that before. Keep an eye on Fife; he might be back. Aaron Miles back on a minor-league contract. The Dodgers signed free-agent infielder Aaron Miles to a minor-league contract. A team spokesperson said the 35-year-old infielder is currently in Arizona awaiting his assignment. Miles played 136 games for the Dodgers last season, mostly at second and third base, batting .275 with three home runs and 45 RBIs. He has hit .281 over a nine-year career with five different teams. The Dodgers signed Adam Kennedy and Jerry Hairston Jr. to fill their backup infield spots rather than re-sign Miles, who hasn’t had a contract since last season. Also Friday, the Dodgers requested release waivers on right-handed reliever Mike MacDougal, who was designated for assignment May 3. MacDougal can become a free agent Sunday. MacDougal designated for assignment, Belisario reinstated. 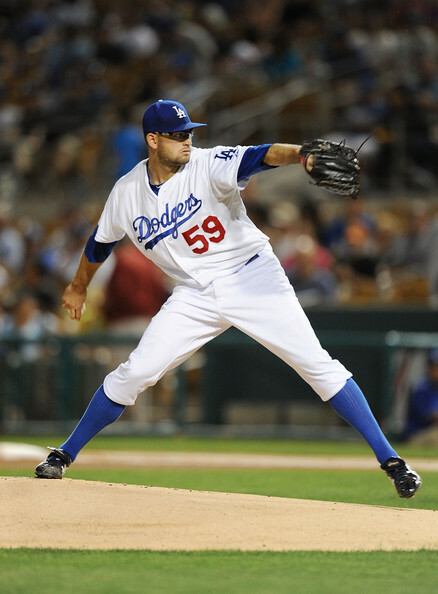 The Dodgers designated Mike MacDougal for assignment Thursday and activated Ronald Belisario from the inactive list. Belisario had been serving a 25-game, league-mandated suspension for a positive drug test, and needed to be released, DFA’d or added to the major-league roster today. Since that inevitability had been lingering since the season began, MacDougal had to be feeling the heat after he allowed five runs (all earned) in 5.2 innings for a 7.94 ERA. The 35-year-old right-hander also walked six and struck out four. The Dodgers have 10 days to either add MacDougal to the 40-man roster, trade him, release him or place him on waivers (within seven days). Dodgers 1, Angels 1 (6). Less than a half-hour after the final out, the sun was shining brightly over Camelback Ranch. But by then the fans were gone, players were changing into street clothes, and the final score — the Dodgers’ fourth tie of the Cactus League season (8-4-4) — seemed an insignificant afterthought. At least, no one in the press corps seemed bothered by the managers’ decision to end Sunday’s game after five and a half innings. The Angels’ Kole Calhoun scored in the first inning on a sacrifice fly by Mark Trumbo. 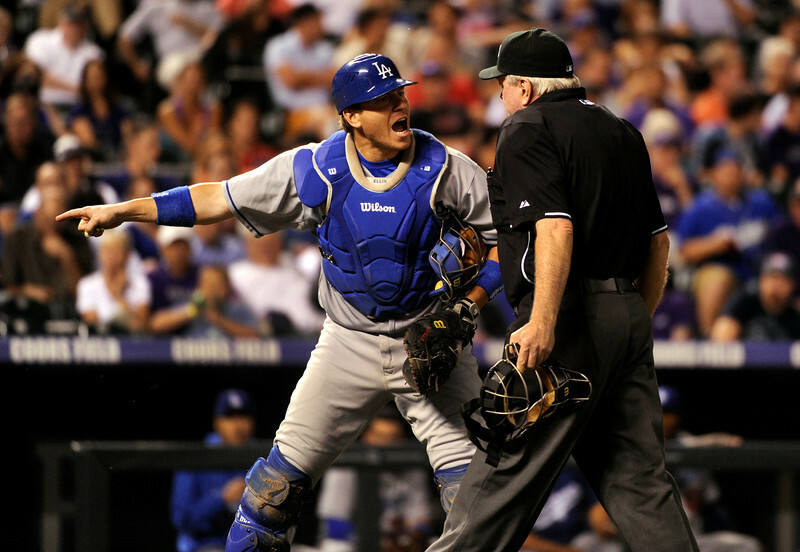 Juan Uribe singled in Adam Kennedy for the Dodgers’ only run in the fifth. Both starting pitchers, Chris Capuano and Anaheim’s Dan Haren, allowed a mere two hits. John Grabow and Mike MacDougal worked one scoreless inning each out of the Dodgers’ bullpen. After MacDougal’s last pitch, rain (and later hail) began to pelt the field hard enough that a tarp was rolled over the infield 1 hour and 16 minutes after first pitch. The only semblance of drama for the Dodgers on this day took place before and after the game, when the second round of roster cuts was announced. Four players left the room in the morning, and catcher Gorman Erickson, catcher Matt Wallach, infielder Lance Zawadzki and first baseman Jeff Baisley were re-assigned to the minor league camp. More on that in tomorrow’s editions.